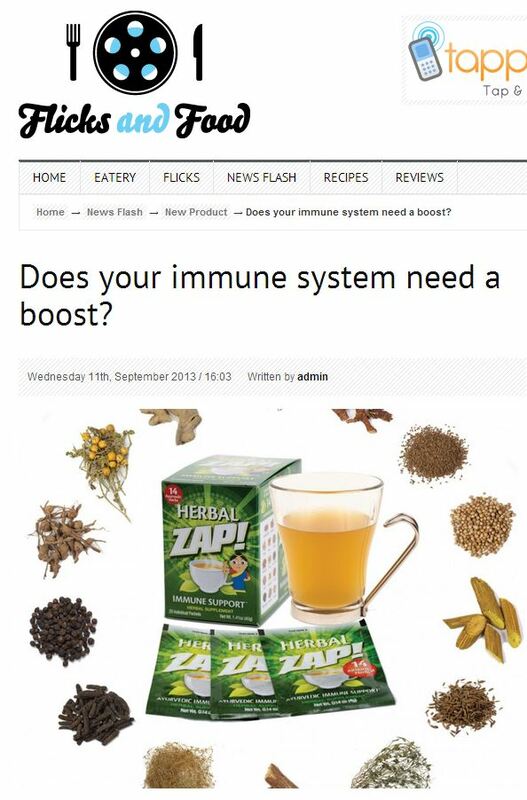 Congratulations to our Client Herbal Zap for their feature on Flicks and Food. Feeling run down? Get the power ofÂ Instant Ayurveda Herbal Zap. SinceÂ Herbal Zap is most powerful when you first begin to feel run down, use it at the first signs your immune system could benefit from support.Â Pour yourself a nice steamy cup and sit back to enjoy the aroma and delicious taste as your immune system receives the goodness of Herbal Zap! The ancient Indian science of Ayurveda is a complete natural health system that focuses on healthy living as well as therapeutic measures that include physical, mental, social, spiritual and environmental harmony. Herbal Zap is formulated according to these principles to bring balance and harmony to your vital energies in an easy to use instantly dissolving delicious beverage. At Herbal Zap, they have been dedicated to sustainable, eco-conscious practices since their founding in 2011. All of their herbs are sourced from independent family farms in the beautiful hills and jungles of Sri Lanka, where they are grown according to traditional agricultural practices to ensure the quality and potency of each ingredient. From gingerâ€™s ability to support the digestive system to liquoricesâ€™ talent for soothing sore throats, each component brings a special health trait to the mix. Herbal Zap is a unique and effective Ayurvedic supplement, developed by Ayurvedic doctors, that will boost along your journey to great health! Find out more at HerbalZap.com.